Set up a double boiler. Get a digital thermometer and a blender or food processor ready. Put the sugar and zest into a saucepan and rub the zest into the sugar to release the oils in the zest and flavor the sugar. Whisk in the eggs, and then the juice. Whisk the mixture over simmering water until it reaches 180F. Whisk constantly so the eggs don't scramble. You will know it's ready when it thickens and turns glossy. This will take 5 to 10 minutes, depending on how hot your water is and how close you set your saucepan to it. Take the pan off the heat and strain the mixture into the blender or processor. Discard the solids. Let it cool down to 140F. When it reaches 140F, turn on the machine and let it go while you steadily add the butter. Scrape down the sides of the machine, if necessary. When all the butter has been added, let the machine go for an additional 3 minutes. Pour the cream into a bowl and cover with plastic wrap, pressed onto the surface of the cream. 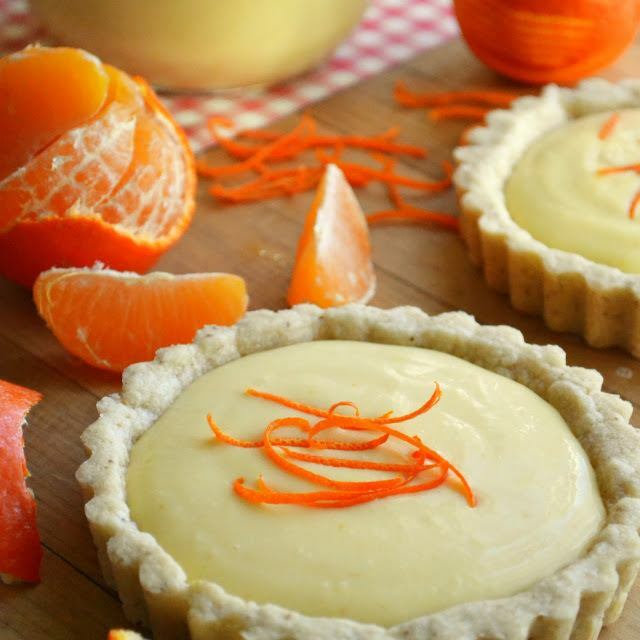 Spoon the cream into cooled tart shells, and serve cold. You'll have some extra cream leftover, which is good because you won't be able to resist eating it with a spoon. Whisk the walnut meal, sugar and flour together. Work in the butter until the dough comes together. Press into 4 individual tart pans. Prick all over with a fork. Set the tart pans in the freezer while you clean up, about 10 minutes. Cool and then remove from the pans before filling.